No, it is not an oversized cotton swab. It's a prop for our roleplaying sessions, a mace, actually, that came into being when a character needed to scoop up some especially sticky spiderweb and decides to use some poor creature's femor. And obviously, she started using it as her weapon of choice. 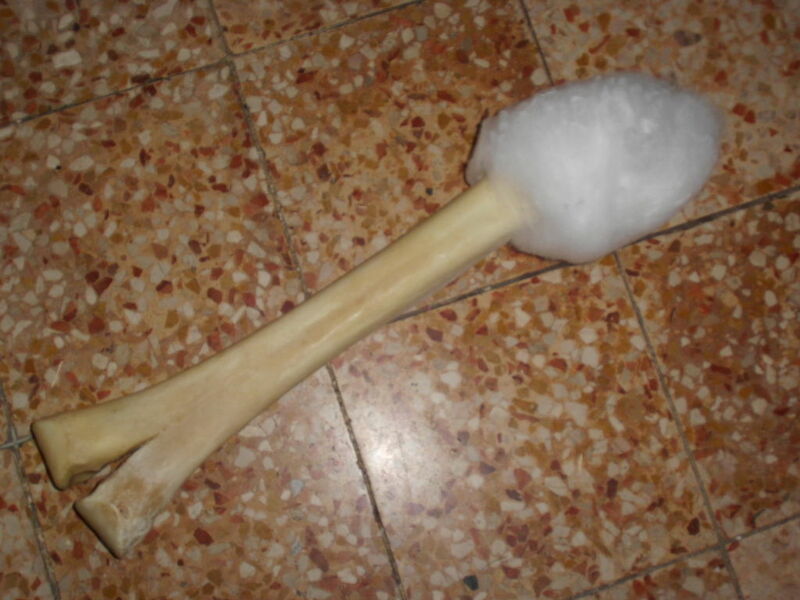 - 1 bone; I used a camel femur, I do not know what you have access to to replace that - you could also make a substitute from any number of materials, see for example INSERT HERE. I should also note that one end already was cut off when I bought mine. First, you need to fix the mesh to the bone. My first idea was to drill holes through the bone near the cut-off end, so I did that. I used an ordinary metal drill bit and some care since this was my first time drilling bone. In the end, I had two holes through and through. The mesh I had was just long enough as I wanted, maybe rather less so, and it fit rather easily over the bone. I pulled it over and held it in place in such a fashion that the holes were covered by the mesh by a good centimeter or so. Also, I apologize for the lack of new picture for this step, you can see the thread in the previous one. ... I was having second thoughts about the strength of the thread, especially since I intend to use this mace every now and then on a friend's head. Don't look at me like that, he always has it coming... And yes, we only use properly cushioned weapons on him. And... why am I justifying myself? Well, no players were ever hurt during our roleplaying session, even those with pyrotechnics. Where was I? Ah, yes. I happened to have my hot glue gun plugged in, and I decided to give the mesh a line of hot glue as additional safety. Next I pulled toe mesh inside out, so to speak, to flip it upwards, over the sawed-off end of the bone. For stuffing, I used fake cobwebs - you know, the stuff that looks like cobwebs if you pull it apart properly - which I had a bag full laying around, but after finishing the piece I think pillow stuffing would work just as well. Anyway, I took a hand full of the stuff and pushed it into the mesh tube, taking care to fill it all the way, including the area around the bone. Be careful, though, as the mash appears to be prone to ripping if you stuff too hard. At least the tear in mine turned out to be small enough to continue. Once the top has the desired shape, within the limits of the mesh's flexibility, I used needle and thread again to make a ring through the open end of the mesh and then pull it tight. Sorry for not making more pictures of the step, but I hope you understand what I mean. This is the time to check whether the stuffing is sufficient to cushion the bone to prevent injury in case you ever hit something. The second picture is a little blurred, sorry. Step 8: Adding Some Fluff - and Done! At this point, I thought the Spiderweb-Mace to be finished, but I realized that the mesh did not really give the desired spiderwebby look. So I took another piece of fake cobweb, one cut to the length of the mace's top and pulled apart properly. Then I wrapped it around the mesh as an additional layer. By interweaving the fluffy stuff rather awkwardly I managed to get it to stay where I wanted to, and cover the hole in the mesh, too. Now you can go around hitting things over the head with it, exercising common sense and caution. It is by no means intended as a weapon, and is meant only as a toy rather than anything else.